As the most important source of energy for life on Earth, the sun warms our seas, stirs our atmosphere, and gives energy to growing green plants. It also charges our laptops and allows us to enjoy hot water for longer showers and endless pots of tea. 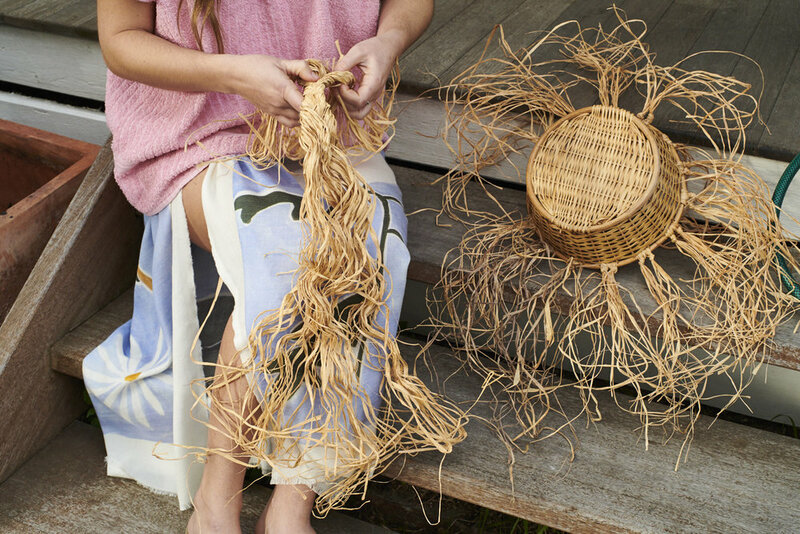 And it is this giant star that has become the center of inspiration for Melbourne-based artist and co-founder of TLC Thea Blocksidge’s latest series of works; woven suns, made from found-baskets and local grasses. While the seasons make their shift and the sun’s circle is at its lowest, we visit Thea in the afternoon sun, watching her weave in her garden and prepare snacks in her kitchen. As we left, and the moon rose over Melbourne, and Thea gave way to a home-cooked meal with her closest friends. To celebrate our friendship, we are currently offering an exclusive run of Thea’s woven suns online. Meet the larger of the two; Gross. And the smaller, more delicate sun, Moyen; here. She has also made us a playlist that welcomes in the crisp winter months, softly rocking us as we wave goodbye to summer. Listen, and be transported, here. Thea wears her own linen dress adorned with our Goodbye Sun silk scarf paired with the Tasmanian Blackwood handmade buckle by Elise Cameron Smith. Thea's hands do the work. We thank our dear friend, Victoria Zschommler for capturing Thea's spirit so effortlessly. Victoria is a still-life, fashion and beauty photographer and a long time collaborator of Mirador. Her refined feminine style and thoughtful detail and colour compositions with both people and objects is a manifestation of her love for art, culture and still life paintings. We thank our right hand muse, Yasmine Ganley of anyonegirl for her written word and curative gifts.